These super low use Sanyo PLC-XU48 LCD projectors tested working perfect, and have low usage. All projectors are under 2500 total hours of usage. The genuine Sanyo lamps installed have anywhere between 200-1000 hours of usage. Projectors are in good cosmetic condition with minor scuffs/scratches from previous usage. Please see description for details. Sanyo PLC-XU48 LCD Projector. Genuine Sanyo Lamp installed with 200 - 1000 hours of total use out of 2000 hours total. Genuine Sanyo Lamp/bulb (installed). Projector testing details Projector and removable parts have been cataloged to prevent false warranty claims & part swapping. The Sanyo PLC-XU48 helps you to make great presentations. The Sanyo PLC-XU48 LCD projector is easy to use. It offers excellent picture quality. This LCD projector can resize up to 1200x1600 pixels. This portable projector is compact and lightweight. So it can be used in diverse settings. 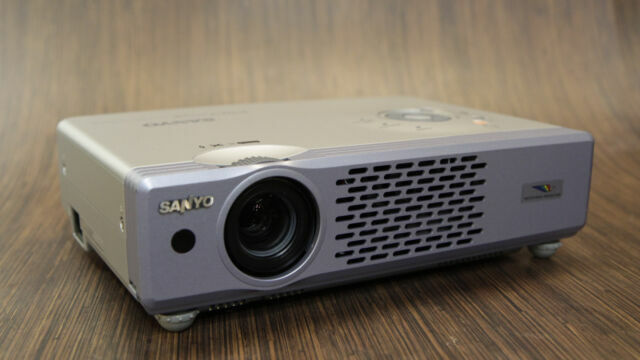 SANYO is one of the leaders in the LCD projector industry. The Sanyo PLC-XU48 is made with only the latest in digital technology. This portable projector is ideal for medium to small sized meetings and conferences. The advanced digital technology of this LCD projector ensures bright picture resolution. item 1 SANYO PLC-XU48 3000 LUMEN XGA HD LCD PORTABLE MEDIA PROJECTOR - SUPER LOW USE!! -SANYO PLC-XU48 3000 LUMEN XGA HD LCD PORTABLE MEDIA PROJECTOR - SUPER LOW USE! !